Our Publishing Company is supporting Book Aid. So, you know how we told you our book for Rumfin costs $10.00? Well, we have chosen to sell our book for this because we are trying to make a difference in the world. We want to change people's lives for the better. Anyway two dollars from each book goes to Book Aid, which is a charity that gives books to children in Africa. The reason the Book Aid is such a good charity is because it helps kids who normally wouldn't get as much of an education or get to experience the joy of books. We love books! As well as book sales, we may plan events just for Book Aid. On this page we will keep you updated on how much money we have raised. 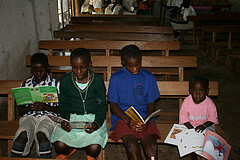 You can find out more about Book Aid here.